Poppy Springs Resort & Spa at Yunogo Onsen, Okayama Prefecture. 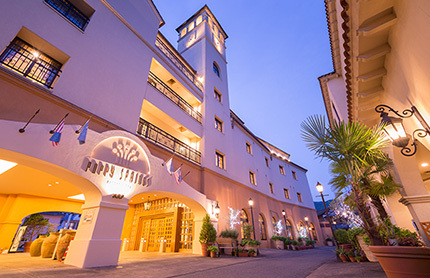 Poppy Springs is a resort hotel built in the California mission-style and located in the Yunogo Onsen town. Enjoy a special moment at Poppy Springs with our French cuisine prepared using plenty of the blessings produced in Okayama, the hot spring spa which we are proud to present, and authentic aromatherapy treatments that will relax your body and mind. 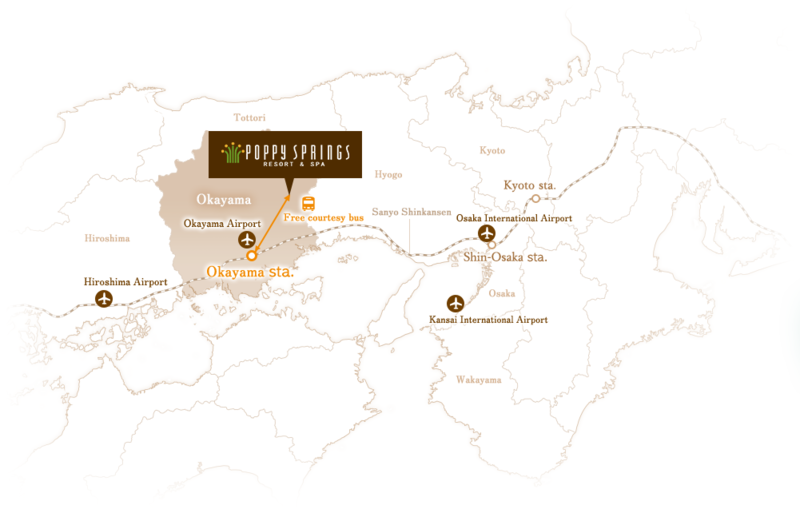 Poppy Springs is located at the center of Yunogo Onsen, a famous hot spring town in Okayama Prefecture, Japan. unogo Onsen is one of the Three Hot Springs of Mimasaka in Okayama Prefecture, a renowned hot spring area in west Japan. Its history dates back as far as 1200 years ago, when it was first discovered. Poppy Springs is located at the center of Yunogo Onsen. Take pleasure in experiencing the water acclaimed for its skin-beautifying effects at our hotel. Okayama is known as a fruits kingdom for its abundant production of high quality fruits which excel in sweetness, aroma, and taste. 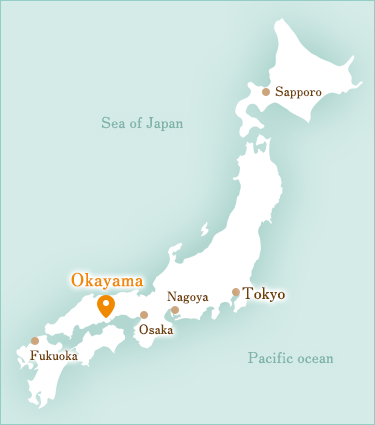 In particular, Okayama lays claim to being the top producer in Japan for white peach, and muscat and pione grapes. These delicious fruits grown under the grace of the sun are a must-try. The Kurashiki Bikan Historical Quarter is a place where you can experience aspects of Japan's wonderful traditional culture amidst traditional establishments built in the Edo and Meiji periods. Kurashiki is also home to many cultural facilities that offer the chance to discover new aspects of the town, including the Ohara Museum of Art, which is Japan's first privately operated museum of Western modern art. A museum with one of the country's few permanent displays of Japanese swords. At the Bizen Osafune Swordsmith Workshop you can see impressive demonstrations by craftsmen who have been trained to inherit the skills involved in various traditional Japanese artistic handicrafts. Tottori Sand Dunes, the largest in Japan, can be reached in about an hour and a half from the hotel by car. Enjoy the view and have fun at Tottori Sand Dunes. If you go to Tottori, you must definitely try the 20th century pears. You are sure to delight in the luxury deliciousness of the pears. Naoshima Island, an island of art, located in the northern part of Kagawa Prefecture. The island is dotted with art works, and reveals different expressions depending on the weather and season. How about renting a bicycle and exploring the island? Hiroshima possesses two world heritage sites. One of them is Itsukushima-jinja Shrine with its history of 1400 years as the subject of devout worship. The other is the Atomic Bomb Dome that continues to communicate to visitors of Hiroshima the misery of the atomic bomb and war, and the vulnerability of peace. The Izumotaisha Shrine in Shimane, renowned for its deity of matchmaking and fortune, is a grand shrine that has a history so long that its establishment was mentioned in the Kojiki, known as the oldest chronicle of Japan. In recent years, the shrine has widely been recognized as a power spot where you can feel the divine ambience. The Himeji Castle, registered as a UNESCO World Heritage Site, is recognized globally as a famous castle amongst all the extant castles in Japan. In addition, the Takeda Castle Ruins, known as "the castle in the sky" or "Machu Picchu in Japan", welcomes flocks of people who visit to take a look at the fantastical landscape. © Copyright POPPY SPRINGS RESORT&SPA. All rights reserved.